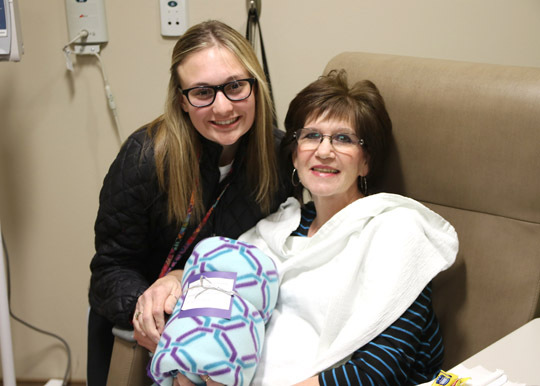 Patients undergoing chemotherapy at the Eleanor N. Dana Cancer Center at The University of Toledo were surprised earlier this month with gifts of fleece blankets from 15-year-old Mae Kennedy of Toledo. “Two years ago, my grandmother was a cancer patient, and she complained of the scratchy hospital blankets at the hospital that smelled of medicine,” Kennedy said. Mae Kennedy gave one of the blankets she made for her project, A Touch of Home ,to Fremont resident Cathy Warwick, a patient at the Eleanor N. Dana Cancer Center. Following her grandmother’s death last year, Kennedy wanted to replace those scratchy blankets with new fleece lap blankets. Kennedy, who is a sophomore at Central Catholic High School, created an organization, A Touch of Home, for a National Honor Society project. She buys the fleece fabric and makes blankets to sell. The remaining fabric and any money she has left is used to make more blankets to give away. Since beginning the project in December, Kennedy has sold more than 25 blankets. April 3 was the first day that Kennedy distributed the blankets at UTMC, where her mother, Melissa Kennedy, is respiratory therapist. This entry was posted on Thursday, April 19th, 2018 at 3:51 am and is filed under Dana Cancer Center, Features, UTMC, UToday .